Unfortunately, Oracle has effectively decommitted Applets. This means you can no longer run the various CMP programs in a browser. You must download them and install them. You must have the most recent Java JRE (Java Runtime Environment) 1.8.0_131 32-bit or 64-bit. It no longer matters which browser you use. Oracle has effectively decommited Applets, so this Applet will no longer run online in your browser, but it is a hybrid you can also download, install and run it on your own machine as standalone application. It will start and run faster if you do that. It will also work safely even if you have disabled Java in your browser. This Applet will show you all the Java system properties. This will help you diagnose problems with the CLASSPATH, which JVM (Java Virtual Machine) vendor and version you are getting, your time zone, etc. Wassup is also available with Java source to download. When you run Wassup as an application it shows you considerably more information. The Java sandbox considers it a security risk to reveal that information to an Applet. Which Properties Will You See? Applications, including Jet-compiled applications, will see the most properties. Signed Applets will see somewhat fewer and unsigned Applets will see only a few. The policy file controls which you will see. You can tell if you are using a 32-bit or 64-bit JVM by looking at the os.arch = amd64 (64-bit) or os.arch = x86 (32-bit) property. If this Applet does not work, check the Java console. You may have very old version of Java or none at all. Applet failed to run. No Java 1.8 or later plug-in found. For this Applet hybrid to work, you must click grant/accept/always run on this site/I accept the risk to give it permission to read the restricted system properties. If you refuse to grant permission, the program may crash with an inscrutable stack dump on the console complaining about AccessController.checkPermission. In the Java Control Panel security tab, click Start ⇒ Control Panel ⇒ Programs ⇒ Java ⇒ Security, configure medium security to allow self-signed and vanilla unsigned applets to run. If medium is not available, or if Java security is blocking you from running the program, configure high security and add http://mindprod.com to the Exception Site List at the bottom of the security tab. Often problems can be fixed simply by clicking the reload button on your browser. Make sure the Java in your browser is enabled in the security tab of the Java Control panel. Click Start ⇒ Control Panel ⇒ Programs ⇒ Java ⇒ Security ⇒ Enable Java Content in the browser. This signed Java Applet (that can also be run as an application) needs 32-bit or 64-bit Java 1.8 or later. For best results use the latest 1.8.0_131 Java. You also need a recent browser. Optionally, you may permanently install the Canadian Mind Products code-signing certificate so you don’t have to grant each time. If the above Applet hybrid appears to freeze-up, click Alt-Esc repeatedly to check for any buried permission dialog box. If you have certificate troubles, check the installed certificates and remove or update any obsolete or suspected defective certificates. The only certificate used by this program is mindprodcert2017rsa.cer. Especially if this Applet hybrid has worked before, try clearing the browser cache and rebooting. 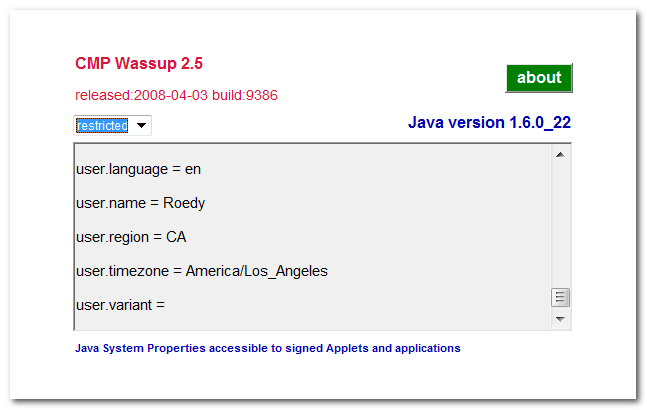 To ensure your Java is up to date, check with Wassup. First, download it and run it as an application independent of your browser, then run it online as an Applet to add the complication of your browser. If the above Applet hybrid does not work, check the Java console for error messages. If the above Applet hybrid does not work, you might have better luck with the downloadable version available below. If you are using Mac OS X and would like an improved Look and Feel, download the QuaQua look & feel from randelshofer.ch/quaqua. UnZip the contained quaqua.jar and install it in ~/Library/Java/Extensions or one of the other ext dirs. Upgrade to the latest version of Internet Explorer or another browser. Click the Information bar, and then click Allow blocked content. Unfortunately, this also allows dangerous ActiveX code to run. However, you must do this in order to get access to perfectly-safe Java Applets running in a sandbox. This is part of Microsoft’s war on Java. Try upgrading to a more recent version of your browser, or try a different browser e.g. Firefox, SeaMonkey, IE or Avant. If you still can’t get the program working click the red HELP button below for more detail. If you can’t get the above Applet hybrid working after trying the advice above and from the red HELP button below, have bugs to report or ideas to improve the program or its documentation, please send me an email at . for the current version of Wassup. WhatÃ¯Â¿Â½s up with your Java environment, classpath, vendor, JVM, and all the system properties. 563K zip for Wassup Java source, compiled class files, jar and documentation to run on your own machine either as an application or an Applet. Runs on any OS that supports Java e.g. W2K, XP, W2003, Vista, W2008, W7-32, W7-64, W8-32, W8-64, W2012, W10-32, W10-64, Linux, LinuxARM, LinuxX86, LinuxX64, Ubuntu, Solaris, SolarisSPARC, SolarisSPARC64, SolarisX86, SolarisX64 and OSX. First install the most recent Java. To install, extract the zip download with WinZip, (or similar unzip utility) into any directory you please, often J:\ — ticking off the use folder names option. access wassup source in repository with [Tortoise] Subversion client on wush.net/svn/mindprod/com/mindprod/wassup/. adjusting as necessary to account for where the jar file is. download ASP PAD XML program description for the current version of Wassup. $1989.00 US donated so far. If the CMP utilities solved your problem, please donate a buck or two, or donate to one of the charities featured in the footer public service ads throughout the website and get a tax receipt. Wassup is free. Full source included. You may even include the source code, modified or unmodified in free/commercial open source/proprietary programs that you write and distribute. Non-military use only.